Three cheers for me because after a year and about eight months I am still working out on a regular basis with my strength coach Andy Wight. I started patting myself on the back in January 2017 for just showing up at his gym and said that Andy was taking me inside my discomfort zone. Although I confess I’m apt to mutter a complaint every now and again, I am well past feeling uncomfortable. In fact, in addition to feeling stronger, I’ve gone in more than once wiped out or grumpy and left renewed. I preach the high value of being active quite frequently and I try to practice it in my own way. I am not a super athlete, but you don’t have to jump on your bike every day or hike a mountain or train for a triathlon, or even a 5-k. They’re all great things to do if that’s what you love. But if they’re not, figure out what you do enjoy doing and take the first step. The key is to keep moving! End of lecture. At my most recent session with Andy, I asked him about hip flexors. They’re a group of muscles at the top of your thighs that help you move your lower body — so you can walk, run, kick, dance, bend over. A lot of us don’t move as much as we should. We spend way too much time sitting — like right now I’m sitting at my computer writing this post and I should get up and at least walk around. Wait a minute, I’ll be right back. Here I am again. I’m working from home today and there’s plenty to do around here. 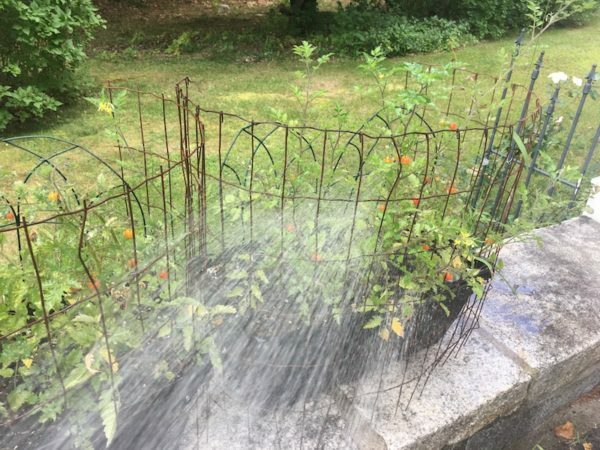 I watered a bedraggled petunia plant on the front porch, poured some water in the birdbath for our bees, threw clothes in the dryer, patted my kitties, and watered the blueberry tomato plants on the back patio (and ate a few because they are sooooo delicious.) Took me 10 minutes max. Back to hip flexors. Sitting too much makes them tight and overactive. That’s right. Overactive. You want to lengthen and calm them down, says Andy. 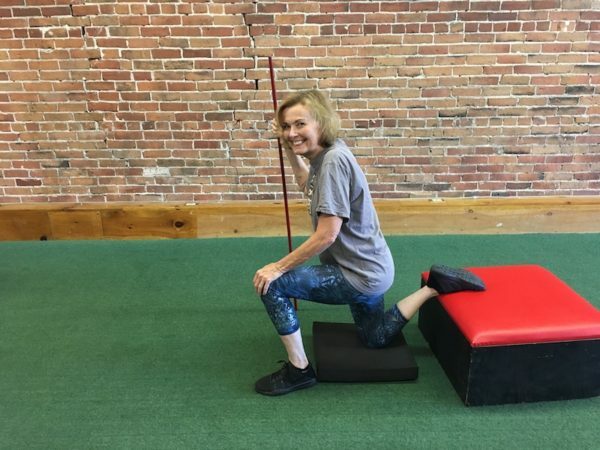 When we sit, it shortens the hip flexors so they always feel tight and when that happens, it can lead to other issues. It can change the gait and even cause back problems. What you want to do is lengthen or stretch them to help loosen them up. It’s also important to make sure to activate your glutes. If you have overactive hip flexors, you’re going to have weak glutes and vice versa. And when you sit all the time, you’re not helping either. Andy showed me three different easy stretches for the hip flexors. If you want to know how to strengthen your glutes, read this post from last November. The first hip flexor stretch is called a couch stretch. At home use the sofa, couch, a chair. Drop one knee to the floor and elevate your foot up onto the couch. You want a nice tall position. Hold about 30 seconds to a minute, each side. You can run through them a couple of times, several times a day. If you hold it a long long time it could make your sore, so ease into it. You’ll feel it in your hip flexor and quad. For the second stretch, put one knee on the floor and stretch that leg out behind you. Bend the other knee out front. Put your hand on the inside of your ankle. Squeeze your glutes and push your hips toward the floor in front of you. We’re using two yoga blocks for the third stretch. Sometimes I’ll use a 12-inch box in the gym. You could use a staircase step at home. The idea is to create some separation. 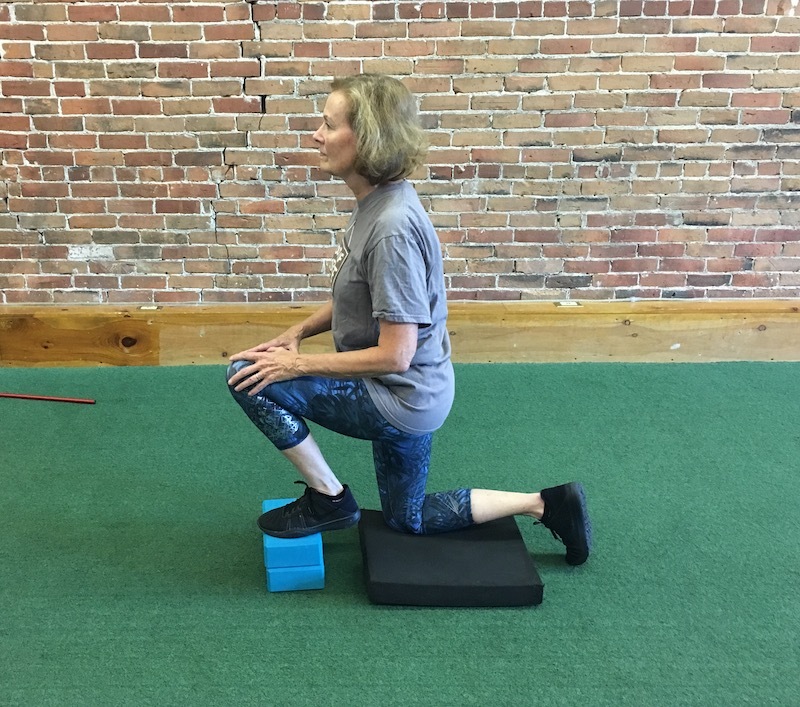 Kneel on one leg and elevate the other one on the blocks or step. If you’ve got some stability or balance issues, you might feel a little wobbly. It can also happen with the first (couch) stretch. It’s ok to have something next to you to help keep you steady. 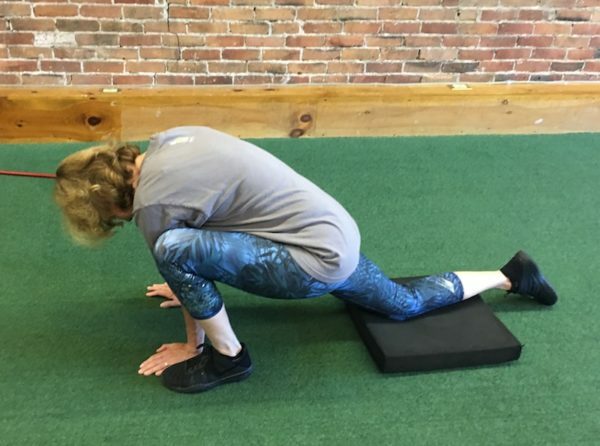 You want to be able to focus on the stretch and not worry about losing your balance. The easiest one for me was the second stretch. As you can see in the first one, I used a stabilizing bar and although I didn’t need it for the last one, I kept expecting the blocks to go flying! You know your body best and what it can and can’t do. Start slow and pay attention. And now it’s time to get up and move again. If you’ve got any fitness questions, send me an email or ask it in the comment box below. I know where to go looking for answers.